Since she was young, Melanie has had a keen interest for wildlife which led her to pursue a B.S. in Zoology at McGill University, Montreal, Canada. Shortly after her graduation, she left Canada to travel and work in the United States. She has been working as a professional wildlife biologist on a wide variety of wildlife-related projects for over a decade, eight of which were in the desert southwest. Among other species, she worked with the Greater Sage Grouse, California Condor, Mount Graham Red Squirrel, Yellow-billed Cuckoo, Desert Tortoise, Utah Prairie Dog, Western Burrowing Owl, and Southwestern Willow Flycatcher. Melanie obtained a M.S. 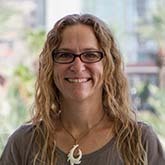 in Applied Biological Sciences at ASU in 2011, and her research was partly funded by the Central Arizona–Phoenix Long-term Ecological Research project (CAP LTER). She performed an urban ecological study in the greater Phoenix metropolitan area, looking at herpetofauna along the riparian corridor of the Salt River. Melanie joined the CAP LTER team in November 2012 as a research specialist for CAP LTER’s biodiversity projects. She is highly involved in the Long-term Bird Monitoring Project and the Salt River Biodiversity Project, where she performs bird and herpetofauna surveys. Melanie truly believes that a better understanding of urban ecology is of fundamental importance for the future of all living organisms as our urban boundaries expand and put more pressure on our ecological resources. Bateman, H. L., J. C. Stromberg and M. J. Banville. 2014. Living in the city: Bird, herpetofauna, and plant communities along the Salt River in Phoenix, AZ. Poster presented at the 16th Annual CAP LTER Poster Symposium and All Scientists Meeting, January 17, 2014, Skysong, Scottsdale, AZ. Banville, M. J. and H. L. Bateman. 2011. Herptofauna and microhabitat characteristics of urban and wildland reaches along the Salt River, Arizona. Poster presented at the 44th Joint Annual AZ/NM Meeting of the Wildlife Soicety and AFS, 4-5 Febrary 2011, Pinetop, AZ. Banville, M. J. and H. L. Bateman. 2011. Herpetofauna and riparian microhabitat of urban and wildland reaches of the Salt River, Arizona. Presentation at the 24th Annual Meeting of the Arizona Riparian Council, 18-19 March 2011, Yuma, AZ. is a unit of the Julie Ann Wrigley Global Institute of Sustainability. This research was supported by funding from the National Science Foundation Long-term Ecological Research Program. This material is based upon work supported by the National Science Foundation under Grant No. DEB-1832016. Any opinions, findings, and conclusions or recommendations expressed in this material are those of the author(s) and do not necessarily reflect the views of the National Science Foundation.